Last year the club had to start the year without Hisashi Iwakuma, James Paxton and Taijuan Walker for the majority of the 1st half, and while Paxton has still been bothered my a flexor strain early in the year, his arsenal speaks to the of an ace. Kyle Seager had a rough 10 games to begin the campaign, before he has reeled off 9 hits for his last 24 AB. With Robinson Cano and Nelson Cruz hitting ahead of him, he should get plenty of opportunities to drive in runs. His success may dictate whether or not they make the playoff coming out of the Al West this year. The gritty 3B signed a big 7 Year extension prior to this season. With that pact done, their 3 – 4 – 5 hitter combination (plus Hernandez) will all lead the team for a minimum of the next 4 years. Under the radar, were the moves to pick up Justin Ruggiano and Seth Smith. Both are prolific hitters against their opposite hand pitchers. If you have these guys as a platoon, than this could workout nicely. Of course Smith could also pick up some reps at 1B should Logan Morrison see some time on the shelf, like he has done so much. The flexibility is a lot better, with Cruz potentially taking some innings in the OF as well. Lloyd McClendon also has Austin Jackson for the whole year in 2015. He should be a lot more comfortable in his surroundings this year. While I would never count on Jesus Montero for anything, at least he showed up in shape this year, and by all accounts he looks decent in camp so far. He could add depth at 1B or DH as well. The man did have a .839 OPS last year in Tacoma, even though he was pushing 250 LBS. He does start the year in Tacoma, but with Morrison’s injury history, his number may be called quick. The Starting Rotation also saw Chris Young vacate his slot, but the team did J.A. Happ for depth in a trade that saw Michael Saunders go the other way. The Mariners were 1 win away from a playoff spot in 2014, even after they struggled with their offense all of last year. When you add the Rotation and the Relief Core together, the Pitching Staff is the best in the American league this year. With Texas losing Yu Darvish for the season, the Mariners will not have to face many aces within the Division. There is no doubt the Angels will still be a strong adversary in the Division. But they are without Howie Kendrick, Josh Hamilton, and they will start the year minus Tyler Skaggs. Garrett Richards is also coming back from injury, and should take some time to round into form. I would say the M’s and the Angels will both make the playoffs this year but I am picking the PAC NW club to take the division. The lineup is nicely balanced more than it has since the franchise has Edgar Martinez in the last years of his service, with a productive Bret Boone, Ichiro Suzuki, Mike Cameron and Jay Buhner at the early stages of the millennium. Robinson Cano has started to hit, and so has Kyle Seager – although both started badly in the 1st 10- game. Good news is that the Halo’s have jumped out of the gate slow too. The Rangers and A’s are also under .500 to begin the year. It is only a matter of time for this club to kick. When they do, it will have a lot of writers and reporters fist bumping and chest pounding. 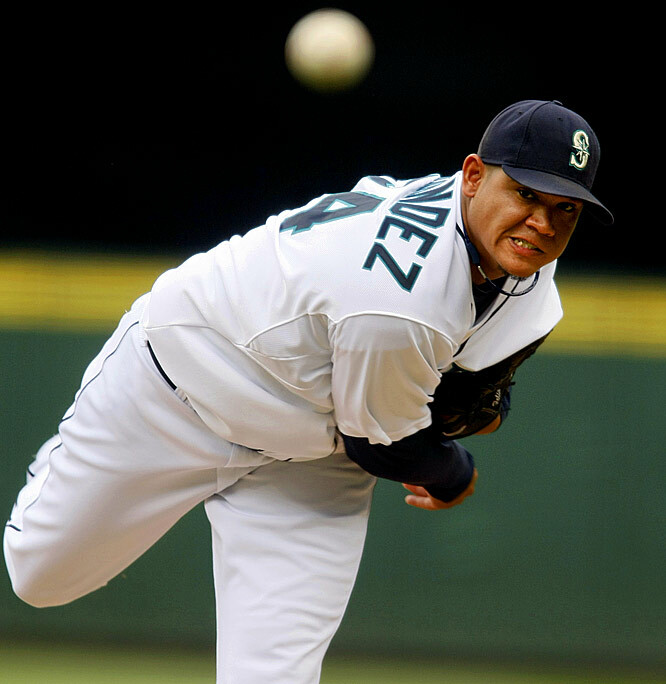 Felix Hernandez has been the face of the Seattle Mariners since 2009 when he won 19 games for the Mariners. He followed up with a CY Young season in 2010. The last few years he has dished out some more of the awesome. This year he is off to another great start. The RHP has a 1.61 ERA and a WHIP of 0.79 in 4 starts, in which he is a perfect 3 – 0. The rest of the Starting Staff hasn’t fared as well, but I foresee great things out of Iwakuma, Paxton and Walker going forward. Posted on April 25, 2015, in MLB Teams State Of the Unions and tagged austin jackson, brad miller, brandon maurer, bret boone, chris taylor, chris young, danny farquhar, Dustin Ackley, edgar martinez, endy chavez, felix hernandez, fernando rodney, franklin gutierrez, hisashi iwakuma, houston astros, ichiro suzuki, j.a. happ, james paxton, jay buhner, jesus montero, Jesus Sucre, joe beimel, justin ruggiano, kyle seager, Lloyd McClendon, logan morrison, los angeles angels, mike cameron, mike zunino, nelson cruz, oakland athletics, robinson cano, seattle mariners, seth smith, texas rangers, tom wilhelmsen, yoervis medina. Bookmark the permalink. Leave a comment.